This is the suggested meditation technique if you wish to participate in activating Earth’s solar plexus, represented collectively by the energy portals located in Africa. Center yourself through deep breathing, focusing on holding the peace and balance in your heart chakra. Allow this sense of inner balance to permeate across your entire body. 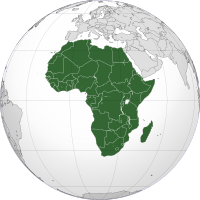 Bring up the image of the Africa continent and use your mind to connect with the energy portals located there. Placed both hands on your stomach area and take a deep breath in to energise your solar plexus . Continue to place your awareness on the solar plexus as you listen to this energy gift from the Elohim, the Galactic Council and the full moon (click Africa Portals Activation, 4 minutes). Remain in a totally relaxed manner, allowing the energy transmission to be fully integrated into your light body. Thank you Ann and Andy for this beautiful activation. God bless you both.